Home Vintage Cast Iron Cookware Favorite Piqua Ware: Favorite Stove and Range Co. vintage cast iron. Favorite Piqua Ware: Favorite Stove and Range Co. vintage cast iron. Vintage cast iron called Favorite Piqua Ware. Have you come across Favorite Piqua Ware cast iron at a garage sale? They have an ultra smooth cooking surface and thiner than modern made cast iron. If you like vintage cast iron rummage your local garage sales and flea market for a Favorite Piqua Ware skillet or bowl. Who made Favorite Piqua Ware. Variables which may affect the value and collectability. Is Favorite Piqua Ware cast-iron any good? The History of Favorite Stove and Range and the company’s predecessors. How to date and identify the different Favorite Piqua Ware logos. Who made Favorite Piqua Ware? Piqua Ware vintage cast iron is often in great shape and still very usable even on modern stoves including induction. So “who made Favorite Piqua Ware?” Favorite Piqua Ware was in-fact the product name for cast iron cookware manufactured by a company name Favorite Stove & Range. Favorite Stove and Range like Wagner Manufacturing Company had a full range of cast iron products not only cast-iron cookware. Do you have a Favorite Piqua skillet or maybe a scotch bowl? Don’t hide them away in the bottom shelve they are fantastic to cook with. If you have a piece or two of antique cast iron? Well these old piece are still great cookers. No need to tuck Grandma’s skillet away in the bottom cupboard. Use these old timers as your go to pan and they’re also a lot of fun too use. 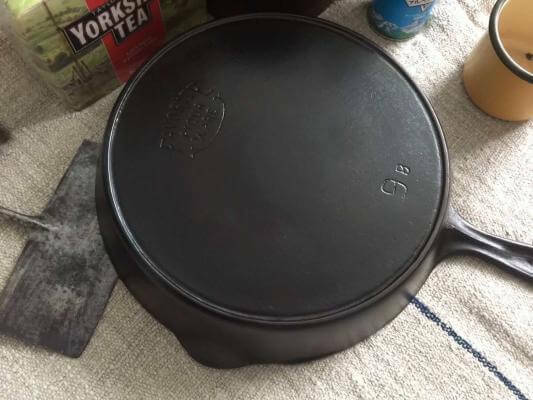 It’s kinda neat that you can cook in an old pan which someone used the 19th century on their coal-range. Favorite Piqua Ware great cast iron without the price tag. Smoothness of the cooking surface including pitting and utensil marks. Favorite Piqua Ware is often less costly than the big two names in vintage or antique cast iron. The two being Griswold and Wagner. So you may find a great Favorite Piqua Ware cast iron skillet or Scotch bowl for a lower price especially if you find a larger piece. Favorite Piqua Ware, is it any good? If you look on eBay you’ll find many Favorite Pique Ware skillets in great shape. You won’t have to search for long to find one in great condition. Favorite Piqua Ware, Sidney Hollow Ware, which is one of my favorites and Wapak often go under the radar with collectors. Often there are many listings to chose from and new listings are regular. However many cast iron enthusiasts enjoy finding hidden gems at antique stores and garage sales. 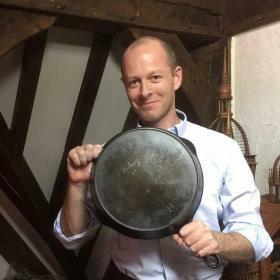 You could attend cast iron auctions and meet others cast iron enthusiasts. The History of Favorite Stove and Range Co.
Where was Favourite Piqua Ware manufactured? Favorite Stove and Range Co made Favorite Piqua Ware cast iron. They manufactured a wide range of cast iron products including cast iron stoves. Their foundry was located in Piqua Miami County in Ohio and like Sidney Hollow Ware the history is fascinating. When was Piqua Ware manufactured. Hollowware may have been manufactured before this date. However 1916-1935 stands out in a possible strategy change towards hollowware or when hollowware was first manufactured in the Favorite Stove & Range Piqua Ohio foundry. The foundations of the the Favorite Stove and Range Co. started in 1832. Before the first Favorite Piqua Ware Skillet came off the line in their Ohio foundry. A different company called W C. Davis and Co established in Cincinnati in 1832. W. C Davis &. Co. founded by Willian C Davis. The W.C. Davis & Co. was a company focused on the manufacture of ironware. They also had interests in another foundry called Anchor Iron Works, located in Cincinnati. Like many foundries W.C Davis & Co. didn’t focus on any one product. Instead they manufactured a wide range of metalware. W.C. Davis and Co. and Anchor Iron Works together manufactured a large range of metalware. W.C Davis manufactured metal coffins called the Fisk’s Metallic Burial Case under license. W.C Davis & Co. also made cast iron hollowware. Although you can still find W.C Davis cast iron it much harder to find. If you have a piece of cast iron made by them, then you have a real piece history. However W.C Davis & Co. can still be found occasionally for sale. Pots and skillets may have a distinctive single pouring spout instead of the double pouring spouts which are standard today. W.C Davis & Co. renamed to Great Western Stove Works. The W.C. Davis & Co was renamed to Great Western Stove Works which included a series of ongoing restructuring efforts. Davis also sold his interest in Anchor Iron Works to Chamberlain & Co. Iron and the casket business to Martin Hale Crane and J.R. Barnesin in 1853. The Great Western Stove Works to Favorite Stove Works. 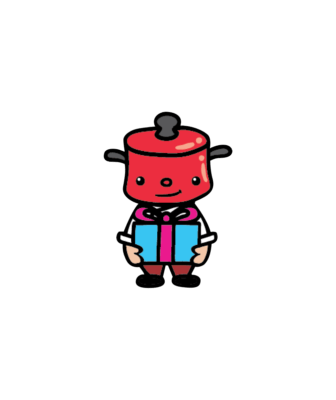 After the of retirement of Willian Davis in 1880 a partner named Willian Boal who had a controlling financial interest renames the company from Great Western Stove Works to Favorite Stove Works. The move from Cincinnati to Piqua. Willian Boal travelled to Piqua and soon after signed a contract to build a new foundry in the city. The growth of Favorite Stove & Range Co. Even by todays standard the company’s foundry was on a huge scale. The foundry was located on ten acres of land. It also employed 550 to 600 people when the foundry became established. Favorite Stove and Range had such an impact on the area, several other companies adopted “Favorite” in their company name. Photo credit to ebay seller pakid*. New leadership and an expansion of manufacturing hollowware. In 1916 Willian King Boal dies and Willian Stanhope Boal his son took over his fathers interests. It was Stanhope Boal who ramps up cast iron hollow ware production. In 1919 a labour strike hit the firm. During this strike workers demanded an extra 25 percent increase for wages for laborers. The strikes lasted for eleven days. Stanhope Boal remained president until 1923. The next five years the company had three other presidents. Willian C. Katker became the final president for Favorite Stove & Range Co. in 1928. The impact on Piqua Ware sales during the Great Depression. Sales declined in the 1930s because of the Great Depression. The passing of Willian Stanhope Boal. In December 17th 1933 Willian S. Boal dies. Favourite Stove & Range Co. liquidates. 1935 the company liquidates, and patents, trademarks and tools were sold to Foster Stove Company of Ironton, Ohio. Chicago Hardware Foundry bought patterns and machinery. Post WW2 and the drop in demand. After restructuring, Katker renamed the company to the Favorite Manufacturing Company. However the company operated on a much smaller scale. They produced coal and wood ranges, gas cooking stoves and hollow ware although molding was out sourced to Champion Foundry Company also located in Piqua. In 1958 the company stoped operation due to the The Post WW2 decline in demand. Piqua Ware cast iron logos How to date Favorite Piqua Ware. Favorite Stove and Range used eight logos for their hollowware range between 1916-1935 seems to be the general consensus. Did they make hollow ware before this date? Yes there are online catalogs to indicate hollow-ware was produced such as scotch bowls, caldrons and spiders. Spiders are basically frying pans with feet to raised out of hot coals. Although the spiders in the catalog do look to have no feet. We know W.C. Davis & Co. produced skillets so it is not unreasonable to think Favorite Stove and Range do as well. It’s also difficult to give an accurate date of manufactured cast iron by looking at the logos. However we can look to other manufactures at the time and look at their logos estimate of which Favorite Piqua Ware logos were most likely the earliest and which were the latest, towards the end of production. Considered one of the older logos, the Favorite Piqua Ware block logo is simple but has plenty of charm. The word “Favorite” is slightly arced and placed near the top of the skillet and Piqua Ware is stamped straight underneath. The lettering in this logo is capitalized in block from. I love the “best o cook in” logo. It must have been pretty good marketing for the time. Similar to the block logo. The word favorite is arced at the top of the skillet similar to an early Lodge or Wagner skillet. Piqua Ware is written under the word Favorite and is embossed straight. Finally “The best to cook in” is written beneath. The lettering again is in block form and in the same size font. Photo credit to bjs602 ebay seller. I’ve only seen this logo on waffle irons. photo credit to iowanimrod ebay member. I’ve only seen this logo a few times on waffle irons. Favorite equals Piqua Ware logo is not an official name for the logo. I haven’t found any information about this logo to name it differently. The logo lettering is arced with FAVOURITE=PIQUA WARE written in upper case and in the same sized font. Photo by m_ho805 ebay member. This Favorite Piqua Ware logo is more stylized than the previous mentioned logos. Again Favorite is arced however the The “F” and “E” FAVORITE are in larger font. Piqua Ware is written in smaller font than favorite. Lettering is all written in upper case. Favorite Piqua Ware smiley logo. Do you have a soft spot for the smiley logo. I sure do. Although it’s very similar to the stylized logo the lettering is thinner. Underneath is ever so friendly embellishing which resembles a smile. This may have been a very popular logo and it’s not uncommon to find a Favorite Piqua Ware with this logo. This logo was made by Favorite Stove & Range however sometimes is referred to as Miami cast iron. The diamond is vertical with MIAMI written in the center, Although the lettering is Capitalized the font size varies to contain the wording within the logo. Miami Skillet made by Favorite Stove Range. Photo credit to kmoore24 ebay seller. Favorite Piqua Ware smiley logo and vertical daimond logo. This logo has both the smiley and the Miami logo. The Maimi logo is in the center while the smiley logo is in the regular position of 12 o-clock. Photo credit goes to oldmarbleyes ebay seller. Puritan logo private Sears Roebuck logo. The Puritan logo was a in stove private label skillet which was made for Sears Roebuck and company which is commonly known as “Sears” department store. Photo by old_irony_sides ebay member. Looking for a great piece of cast iron cookware then a Piqua Ware skillet could be just what you’re looking for. Favorite Piqua Ware cast iron tends to have smooth cooking surfaces like many of the manufactures at the time. However a Favorite Piqua Ware skillet is likely be cheaper than a Wagner or Griswold skillet. Furthermore a Favorite Piqua Ware skillet is great to cook with. There are some great bargains at garage and estate sales and auctions. Online stores are also a great option. 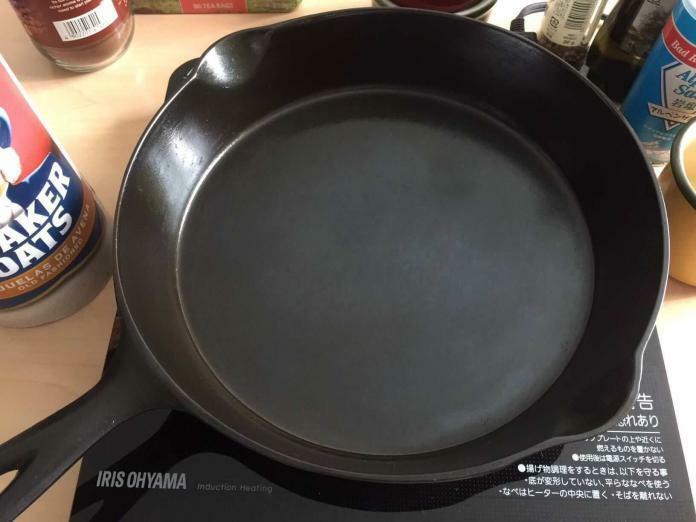 Although you tend to pay internet prices you also have a wider choice to find a skillet that suits your needs. Favourte Piqua Ware is fantastic vintage iron if you find a nice piece at a reasonable price I think it will do you do proud for many years after all these pieces are or nearing one hundred years old and they cook just as well today as they did all those years ago. Previous articleWapak Hollow Ware Co. Find out more about Wapak cast iron. Next articleWhy buy Le Creuset, it’s expensive. Is it really worth it?